February is National Wedding Month, and businesses have plenty of ways they can assist couples in making their dream ceremonies a reality. Weddings are an important but also stressful time, where any help is welcome, and promotional gifts such as planners and calendars can facilitate the planning process while putting organizations’ names into a field that’s ripe for making relationships with consumers. However, organizations that really want to make an impact may want to consider making larger donations to the ceremonies themselves – or even sponsoring a ceremony. Small businesses often struggle to find a foothold against larger competitors, but one of the few advantages they may possess is a strong tie to the local community. Companies that want to gain a positive reputation in their hometown should be finding ways to become a daily part of their neighbors’ lives. That can mean more than just putting out a product that customers will use on a regular basis. By getting involved in events such as weddings – which are sometimes costly and challenging, but almost always touching and memorable – businesses can also show their commitment to the meaningful moments in their customers’ lives. A business may gain a name for itself by caring about its clients or, at the very least, earn some free advertising. Food is often the center of wedding guests’ complaints. Bridal Guide magazine listed inedible food as one of the top 10 wedding gripes, but not having enough food is another easy way for a reception to falter. Yet, these problems are not usually due to a lack of effort on the part of couples – catering, including dinner, cake and alcoholic beverages, usually makes up a substantial portion of people’s budgets, and the time and effort required to make a menu to suit everyone’s tastes can be daunting. Businesses, especially those in the food industry, can ease some of the catering stress by donating a cake, cookies, an entree or even the flatware to help save couples some of the expense. In return, they may need only recognize the contribution in the program or on a card stand, or include businesses’ cards in the party favors. Speaking of party favors, the cost of parting gifts can really add up for couples who want to send their guests home with some form of wedding memorabilia. Party favors are another prime opportunity to score free marketing via personalized calendars and other forms of promotional products. Personalized tote bags or mugs with the couples’ monogram may be a cost-effective and convenient gift. While companies have earned themselves an easy form of advertising, they should be wary of pushing their brand or logo too much onto wedding guests, as this can feel crass and over-the-top. Merely earning some form of acknowledgement from the bride and groom may be enough to drum some business in a tasteful manner. 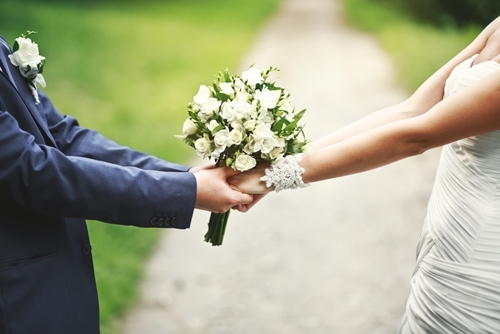 There are plenty of components of a wedding that businesses can help sponsor. They can volunteer to construct an arbor, donate flowers or help coordinate renting tables and chairs. Of course, there is also the possibility of sponsoring the entire wedding, which some couples gladly welcome. Companies will have to work with the bride and groom to figure out how to best weave in acknowledgements and possible forms of marketing but, as with the party favors, the best tack for couples and businesses alike is tact. Businesses who are trying to get their name out to the public will have earned themselves enough free publicity through a mention at the toast and possibly their logo stamped on gift bags or invitations.